Today's nails are a cool baby pink, the shade reminds me of sugared mice or the icing you get on top of iced buns. A lovely pastel shade from Stargazer's Gel Effect Nail Polish range which applies easily with a nice flat brush and glossy results. This is two coats without top coat to show you how glossy it is, however I applied top coat after the photos were taken to extend the wear. Stargazer is a UK based cosmetics company and have an on trend range of hair products, cosmetics and nail care. All products are made in the UK and are not tested on animals - hooruh! The Stargazer Gel Effect Nail Polish is an easy to apply extra glossy nail polish that has all the benefits of gel polishes without the hassle of the application. The formula is 5-Free meaning it does not contain Toluene, Dibutyl Phthalate (DBP), Formaldehyde, Formaldehyde Resin nor Camphor. The Stargazer Gel Effect Nail Polish is currently £3.50 for a 10ml bottle. UK shipping starts at £4 and is free on orders over £50, International shipping is also available. You can keep up to date with Stargazer on Facebook, Twitter, Instagram, Pinterest, YouTube & Google+. Stargazer is a UK based cosmetics company and none of their products are tested on animals. 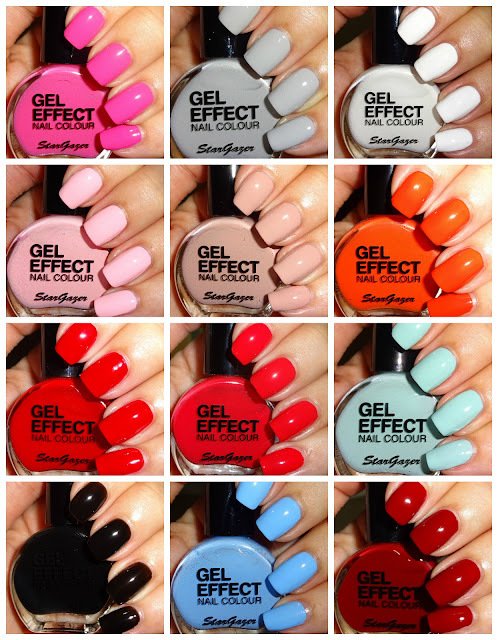 This product was sent to my for my honest review, I'm going to enjoy using their Gel Effect Nail Polishes. Click on the Banner below to be taken to Stargazer! MoYou Nails Halloween Giveaway - 5 Prizes!!!! !